Selected Malts – Royal Brackla sherry finish 55,5% ABV! Dear friends, followers and supporters alike! A couple of days I received a package from my two good friends Patrik and Mikael, the founders of the all new swedish independent bottler named Selected Malts! To my great joy the package contained their second bottling, wiihooo! This time around we are talking about a Royal Brackla that has first been matured in a single bourbon hogshead and then transferred for a final maturation/finish in two 128 litre european oak 1st-fill oloroso sherry quarter casks. The whisky was bottled at cask strength, no filtration and likewise no coloring was done! The casks gave 397 bottles. This whisky will be released at the swedish state monopoly this monday (23:rd of April) through the "order-assortment". You can view the whisky by clicking here. Ok folks, let's see what we have here! The first thing that strikes me is that this whisky is very vinous (red wine), actually almost drawing towards a slight touch of (red) glühwein spices. Above that layer I find very delicate notes of peach candy together with a very mellow, but quite thin, vanilla. Shaking the whisky vividly to stir up some more notes/scents I actually get something reminding me of port wine. The whisky calms down after the stir and now I discover ripe fresh rhubarb that intermingles perfectly with the peach and the vanilla. All in all the notes on the nose is like a fight between the bourbon hogshead and the oloroso quarter casks, between vanilla and the vinous stuff. Very interesting! Ok, what about the taste?! Fascinating! It actually starts of quite salt-y, I did not expect that at all! Before the salt, for a split second, there is however some very mellow and rich vanilla, but then comes the salt and after just two seconds or so I realise that the salt is clearly infused with ”sour” raisins (perhaps better described as red grapes on their way of becoming raisins). Intermingling with the strange grapes are definitely freshly squeezed rhubarb juice (if there ever was such a thing…). However, all of these rapid tastes mellows down rather quickly and gives way to an absolutely beautiful mix of almond paste and/or marzipan coupled with a big vanilla. In the aftertaste there are still traces of the salt-y beginning, but most of all the aftertaste is dry, dry, and dry, with traces of fresh ginger. The aftertaste ends with ”vapours” of almond paste rising to the roof of my mouth together with leather-y vanilla. On the nose this whisky does not at all behave like a standard/classic sherry finish would (with raisins and figs etcetera), rather the sherry behaves like red wine and the nose is therefore quite confusing with it’s fight between the two types of casks involved. The great thing about the taste is that it opens up on salt and then moves into the mellow and rich vanilla. Also, the taste really evolves in my mouth, a true journey of flavours! A job well done selecting this whisky (with it’s unusual elements on both nose and taste), so that the whisky nerds in Sweden can taste something truly different. Sláinte! Big thanks to the guys at Selected Malt for the opportunity to try their second release and for the opportunity to be able to review it before its release! Please make sure to follow my FB-page by clicking here, my instagram by clicking here, and my twitter-page by clicking here. Copyright © and All Rights Reserved on all tasting notes and text by SamuelWhisky and pictures likewise belong to SamuelWhisky, unless stated. If you would like to use any such material that belongs to SamuelWhisky or associated with SamuelWhisky, please ask by sending me an email to samuelkarlssonorebro [at] gmail dot com and by stating the source. The Macallan – Limited Edition 2017 – Classic Cut 58,4% ABV! Dear friends, followers and supporters alike! When working the beer and whiskyfestival in Gothenburg (for Edrington) about two weeks ago, I gladly noticed that we had a new expression of The Macallan with us in the stand! 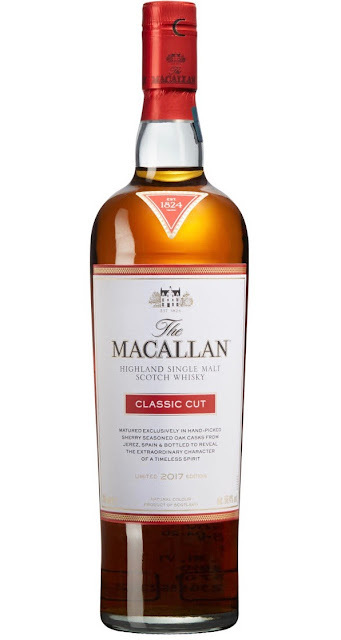 The name of this new Macallan is ”Classic Cut”. Being very lucky indeed I was allowed to draw a small sample for reviewing, so today I share with you my thoughts and impressions of it! 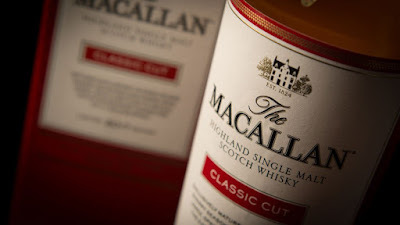 So, what do we know about this new expression of Macallan? First of all we know that it has been bottled at 58,4% ABV. This fact, taken together with the design and colour of the label and the box suggests that the distillery and branding department wants us to associate this release to their previsous cask strength bottlings (which have both been bottled as 10 years old and more recently as NAS). Also, taking a look at the distillery website it is clear that the whisky has been bottled at natural colour and that it has been matured in a combination of American and European ”oak casks seasoned with Oloroso sherry from Jerez, Spain”. What is however not known to the consumers is if the casks used are 1st-fill, 2nd-fill etcetera, nor what the size(es) of the casks used are. In addition it is not known to consumers if the strength is in fact proper cask strength, or vatting strength, or if the strength has been reached by dillution (by watering it to this specific strength). From the distillery website we also know that this edition of Classic Cut is a Limited Edition for 2017. So what does ”limited” mean in this case? First of all, from surfing the web I have found sources who state that the number of bottles are limited to 90000 world wide. I have also found sources who state that Classic Cut is a one-off, never to be repeated again. In order to try and find out in what way this truly is a limited edition, I contacted my good friend Mattias Skoog, the Nordic Brand Ambassador for The Macallan (and for Highland Park). He told me that there in fact will be a Classic Cut 2018, another Classic Cut in 2019, and (probably) so on! So what does all this talk of one-off, never to be repeated again really mean? Well, Mattias was also kind enough to send me a document (a so called Sell Sheet) which holds info that shines a light on this question. The document states: ”This special and memorable flavour profile will never be repeated” and ”…this particular whisky profile will never be repeated”. Aha, it is the profile that will never be repeated again! And what is the flavour profile in question? Well, the box clearly states ”Creamy vanilla, sweet ginger, warming oak”, which I interpret to be the flavor profile for this version of CC. In conclusion, this most likely means that the next CC (2018) will have another flavour profile, so will also the next CC have☺This probably means that the composition of casks used will vary from edition to edition. All of this makes it clear what, on the distillery website, is meant by the statement that this edition of Classic Cut is the first release in ”a [new] series of annual expressions”. Here in Sweden, the CC 2017 will be available this Friday (20th of April) at the state monopoly and you can view it by clicking here. Ok, now that we have sorted out all of the details, let’s investigate the whisky itself! Holding the glass a couple of centimetres from my nose, I get really mellow medium-dark moist raisins with elements of lightly vanilla-infused honey, definitely coupled with cacao (drawing towards a bar of milk chocolate). There is also very slight traces of cold coffee. At this distance everything is soo soft, and it is not until I put my nose in the glass that I actually feel the high strength. Nosing some more with my nose really in the glass, in the very top layer of the nose I get a prominent mix of sweet and sour drawing very close to mashed red grapes. Below this layer I find sugar zyrup made from raw-sugar, together with quite fat vanilla (medium-dark fudge). Below that, in the bottom layer, I get very slight traces of oven-baked slices of apple, intermingling with medium-dark marzipan. Taking a tiny sip it all starts of soo sweet and smooth (which for me is incredible at this strength), the taste is definitely dominated by ”dark” tastes, in fact much darker profile on the taste than on the nose. In the initial sweetness and smoothness I find all the tastes that I expect from a sherry matured non-peated whisky; especially dark raisins and moist dried figs. Aside from that we have drizzling honey, the sugar zyrup made of raw sugar, and even a touch of leather-y notes. It is not until taking a bigger sip that I find a quite robust strength together with a slight layer of almond paste. Then the taste evolves slowly and gets below medium-dry, than even drier, almost drying my mouth now (from something tannin-esque). In the aftertaste I get slight traces of bitter almond intermingling with slight traces of vanilla. This whisky definitely tastes as being well and above 10 years old. In terms of recipe my impression is that european oak sherry casks dominate in the mix. I would describe this dram as a ”light” sherry bomb, not because it in any way is ”watery” or wimpish, but because it never gets out of hand or, so to speak, goes crazy; the recipe has obviously been weighed very carefully, I might even say with a great deal of brilliance. Obviously the whisky maker has aimed for drinkability for the big whisky drinking audience, and has indeed managed to achieve just that! All in all a great dram for a good value/price, well done! I really look forward for to the next releases of CC and to find out what their respective flavour profiles will be! Big thanks to Edrington for the great opportunity to review this whisky before its release! Please make sure to follow my FB-page by clicking here, my instagram by clicking here, and my twitter-page by clicking here. Copyright © and All Rights Reserved on all tasting notes and text by SamuelWhisky and pictures likewise belong to SamuelWhisky, unless stated. If you would like to use any such material that belongs to SamuelWhisky or associated with SamuelWhisky, please ask by sending me an email to samuelkarlssonorebro [at] gmail dot com and by stating the source. Springbank 12yo Cask Strength vs. Longrow Red 11yo! Dear friends, followers and supporters alike! A couple of weeks ago I was contacted by swedish importer/distributor Symposion asking me if I was interested in receiving samples for reviewing some of their coming whiskies. On offer was lots of whiskies and as I have done before I only signed up for samples for Springbank Distillery. 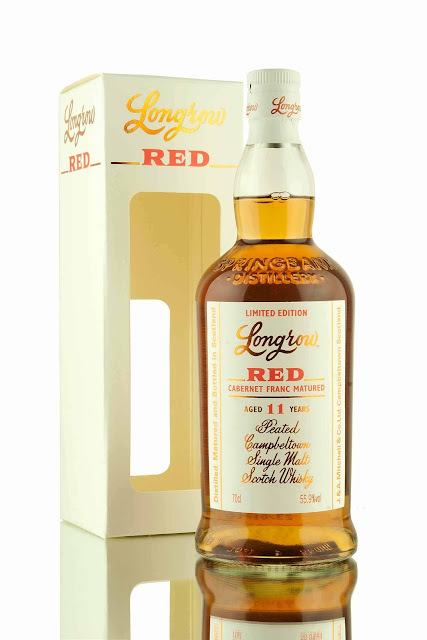 Last week a package finally arrived and so today I bring you my review and thoughts on the latest version of Springbank 12 yo Cask Strength, and likewise the latest version of Longrow Red 11yo. Here in Sweden both of these will be launched at the swedish state monopoly the day after tomorrow (the 12th of April), in a so called web-release. The products can be viewed by clicking here and here. 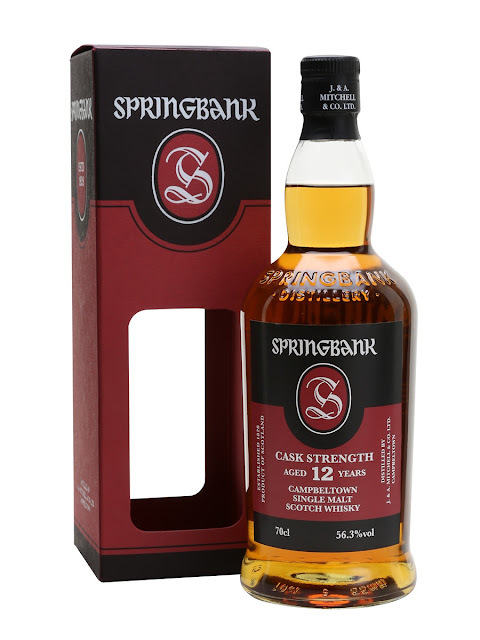 So, in terms of contents/recipe for the respective whiskies it goes like this: The Springbank (around 15ppm) has in this particular case been matured to 70% in sherry casks and the rest in bourbon casks (unfortunately I have received no info on kind of oak for the sherry component, nor filling in terms of 1st-fill, 2nd-fill, etc.). The ABV is 56,3%. Sweden receives 575 bottles (number of bottles produced in total is not stated). The Longrow (around 55ppm) has in this particular case first spent nine years in bourbon casks (filling not stated), and then two years in french (225 litre) barriques that has previously held South-african redwine from De Toren Private Cellar in Stellenbosch (filling not stated). The ABV is 55,9%. Sweden receives 612 bottles out of 9000 bottles in total. Ok, let's do a kind of comparison and see what we have here! Mmm, classic Springbank! Lots of ”warm” and intense, very deep, citric sherrynotes. A great portion of raw-sugar that intermingles seamlessly with the earthy but gentle (kind of leather-y) peaty-ness. Above all, interestingly enough the most prominent things on the nose are stawberry jam, apple sauce and peach candy, all three very delicate and gentle indeed. The nose on this one is something entirely different from the previous! The very center of the nose boasts of Werther’s creme caramel (intense deep vanilla and melted butter), together with ”old” dark honey (”stiff”/non-liquid honey). In the very upper register there is a wee tad of… Cachaça. Slight (!!!) traces of peat. There is also a slight, slight, slight touch of very over-ripe pear, but nothing, absolutely nothing makes me think of red wine. The bourbon maturation and white oak has definitely had more impact than the red wine finish and the european oak. Again, warm and very dry intense sherry! Yes, very dry, but sweet sherry that both makes my mouth dry and makes it water-y. The peatyness is big and definitely warms my chest. This whisky really evolves in my mouth and goes from beautiful raw sugar-y fruity sweetness to a great leather-y dry peatyness (with a big portion of almond paste) that really takes a hold of my mouth. Very ”chewy” aftertaste and my mouth keeps altering between dry and watery. It all ends in some kind of peated overripe banana. And the winner is… Springbank on the nose and Longrow on the taste! Big thanks to Symposion for sending me these samples and for the opportunity to review them before the release! Please make sure to follow my FB-page by clicking here, my instagram by clicking here, and my twitter-page by clicking here. Copyright © and All Rights Reserved on all tasting notes and text by SamuelWhisky and pictures likewise belong to SamuelWhisky, unless stated. If you would like to use any such material that belongs to SamuelWhisky or associated with SamuelWhisky, please ask by sending me an email to samuelkarlssonorebro [at] gmail dot com and by stating the source.